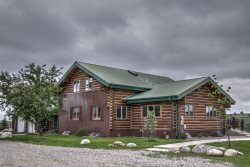 Enjoy the ultimate ski vacation, the scenic Beartooth Highway or your outdoor hiking adventures in this newly remodeled home with ample amenities. Located in the town of Red Lodge, this two bedroom home, just minutes from Red Lodge Ski Mountain and only a 6 block walk to Red Lodge's downtown, is a great place for couples looking for a relaxing get away or families with children! Dogs are welcome too! After an amazing day on the slopes, hiking, rafting, or shopping downtown, spend your evenings quietly dinning in and soaking in the hot tub or hit the downtown’s finest restaurants. You don’t want to miss out on this home! This private home sleeps 6 comfortably and the dining area seats 6. Owners of this property are motivated to to rent and are open to seasonal stay of longer that a month. Please contact AAA Red Lodge Rentals management company for rates. Please note this home is Non-smoking, and does NOT have air conditioning, cable or satellite TV service or have a garage. I use AAA every year & have gotten to know the staff. I've never had a bad experience & love how helpful they are always! Loved the Alpine Adventure! Close to family & town. Super clean & decorated so nicely. Will definitely book this property again!! Thank you!! Clean, comfortable house The house was perfect for our family of four and the backyard was great for our puppy. Definitely one of the nicer dog-friendly places we've stayed, with hardwood floors and attractive furniture, as well as a well-stocked kitchen." Clean, comfortable house The house was perfect for our family of four and the backyard was great for our puppy. Definitely one of the nicer dog-friendly places we've stayed, with hardwood floors and attractive furniture, as well as a well-stocked kitchen. Had so much fun last weekend, decided to come back for Christmas Stroll Fun times eating s'mores in the middle of Broadway and people watching at the Stroll. Yellowstone Wildlife Sanctuary-Rock the porcupine was our favorite. A visit to Red Lodge where I grew up. We camped, rode horses, visited old friends from high school. Favorites are hiking the Lake Fork trail to lost lake, watching the full moon rise from the west bench. Third time at Alpine Adventure We skied and went to the Pollard where the High Country Cowboys were playing country western music and yodeling-awesome and so much fun! We'll be back!! Thanksgiving 2015 Favorite moments were enjoying the Thanksgiving feast here at the house, walking downtown for dinners, watching the beautiful snow falling and skiing at Red Lodge Mountain on the first day of ski season. We really enjoyed ""Alpine Adventure""-very cute and comfortable. Colors and decor very cheery and fresh. We had more than enough space and wanted for nothing! Thanksgiving 2015 Favorite moments were enjoying the Thanksgiving feast here at the house, walking downtown for dinners, watching the beautiful snow falling and skiing at Red Lodge Mountain on the first day of ski season. We really enjoyed "Alpine Adventure" - very cute and comfortable. Colors and decor very cheery and fresh. We had more than enough space and wanted for nothing!" Renting a house for a month in Red Lodge was on my bucket list! The highlight was driving the Beartooth Pass and listening to Rock Creek. I saw a healthy BLACK BEAR next to the creek. In the month I was there there were several bear sightings, lot's of wild turkeys,and the white-tail deer who consider the yards around us as home right now. Chief Joseph Highway is a must see and of course Yellowstone National Park!